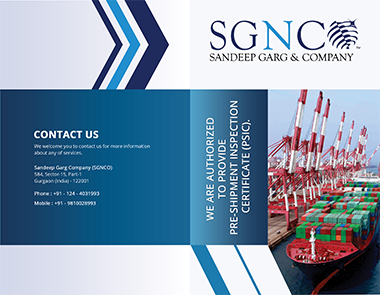 SGNCO is an organization of seasoned repute when it comes to scrap management services and the inspection of metal and metal alloys. It has not only served various companies as their desired inspection partner but has also acquired many clients across the globe, owing to its continuous and extensive researches on potential markets and ways to grow its business. An X-ray Fluorescence or XRF Analyzer plays a key role in the elemental and chemical analysis. Widely used in commercial chores and research works, the XRF handheld analyzer provides a quick and qualitative investigation of elements ranging from Magnesium to Uranium. The XRF handheld analyzer services by Sandeep Garg and Company, comply with international quality standards followed by countries like UK, Germany, Australia, and the USA, and are not only cost-efficient but also easy to use. The XRF hand analyzers SGNCO come with hot-swap dual batteries, which enable them to function for long hours without any downtime. These analyzers are manufactured to provide accuracy apart from its multi-elemental feature. Among our many services, XRF handheld analyzer rental is something which has proven highly beneficial to our customers, since it gives clients the convenience of availing the latest technology without the expenses attached with a full-fledged purchase, while also getting their purpose served. The XRF metal analyzer is also very assistive in metal composition analysis and is brought to use when determining the quantity of each element present within a given sample. This analysis in heavy industries helps avoid issues like metal corrosions. Catering to a large portion of the periodic table, the XRF analyzers come of use in industries like mining where they are required for learning the metal composition, and also in manufacturing where they help with metal chemical analysis. The mechanical industry also employs SGNCO’s services for investigations pertaining to metal composition, metal chemical analysis and metal alloy composition. Through XRF handheld analyzer rentals, the agriculture sector can make reliable environmental screening and avail of soil testing services and accurate mineral analysis. Owing to its feature regarding fast and accurate results, an XRF analyzer comes to aid in contaminated soil sites. When buying precious metal jewelry, we always feel the requirement of a process that is easy as well as reliable for testing the authenticity of the metals used. The precious metal jewelry and apparatuses can now be tested as the XRF rental allows chemical analysis for metals, thus revealing their actual composition. With these positive metal identification services, one can evaluate the precious metal objects in a transparent way. Other than the above-mentioned tests, the range of instruments that we have also facilitated ROHS/WEEE analysis. An XRF handheld analyzer has proved itself revolutionary, with respect to ROHS and WEEE compliance. According to ROHS compliance requirements, only an agreed level of hazardous elements, like lead or mercury, should be brought into use in electrical and electronic equipment, and this can be achieved with the help of an XRF analyzer. At SGNCO, we have identified, through our years of experience in the industry, the wide range of purposes that XRF handheld analyzer serves. Ensuring stringent compliance, consistent operational analysis and flexible rentals, we have XRF handheld analyzers conveniently accessible to our extensive clientele. Get in touch with us today to get a quote for our service.